During the 2018 Shanghai Science and Technology Festival, "The Union of Popular Science Venues in the Yangtze River Delta & the Curatorial Forum on Co-building and Sharing Science-Promotion Resources" was held in Shanghai Science and Technology Museum on May 22, 2018. More than 240 delegates from some 150 popular science venues, enterprises and universities in Shanghai, Jiangsu, Zhejiang and Anhui provinces attended the conference. At the conference, the Union of Popular Science Venues in the Yangtze River Delta was established, and discussions were held around such topics as the vision for the long-term cooperation among the popular science venues and the co-building and sharing of science-promotion resources. 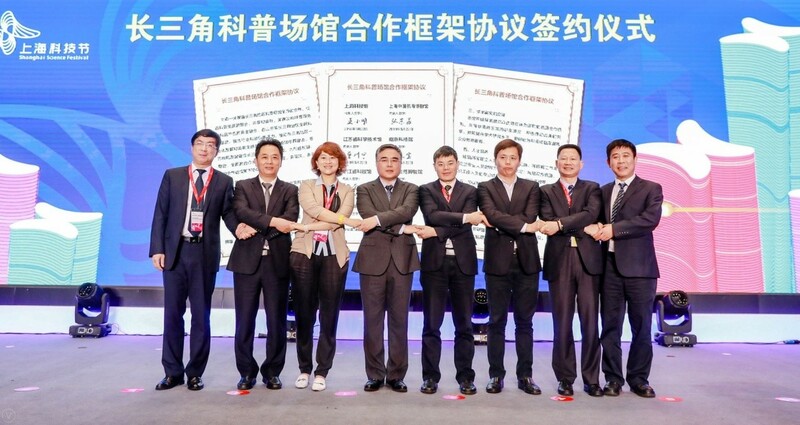 As one of the main sponsors, Shanghai Science and Technology Museum signed the Framework Agreement on Cooperation among Popular Science Venues in the Yangtze River Delta with other seven other sponsors, in the hope of making its education activities and exhibition resources available to the rest area of the Yangtze River Delta.